The Practical Entrepreneurship Certificate Program by Columbia Business School provides participants with an intensive, “hands-on” course focusing on the creation, evaluation, development, and launch readiness of a new business or social venture, with a focus on rural youth. 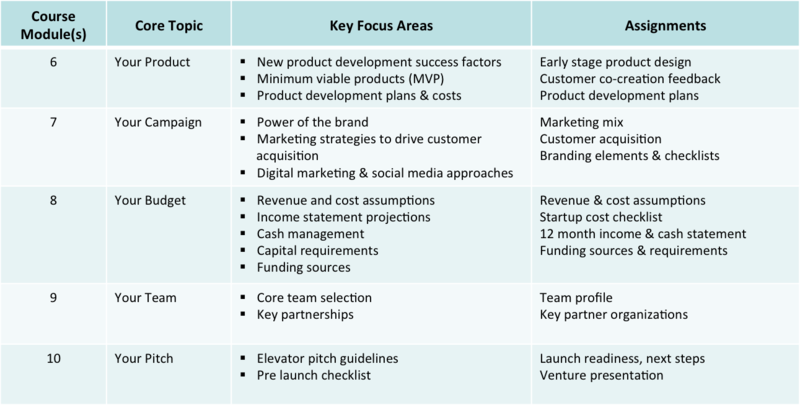 For each new venture, key issues are addressed in ways highly consistent with other formal venture planning processes including: business model development, customer discovery, product-market validation, industry and market analysis, product or service innovation, brand development and go-to-market strategies, team selection & management, profit models, financing, and legal considerations. The course is 10 modules with a proprietary sequence of class topics, activities, and assignments (see tables below). Each student is provided with a workbook with all topic slides and worksheets to help guide the students in their research and strategic thinking for each element of their business model and subsequent laugh plan. provides teaching materials and student workbooks in both English and French. Throughout the class students refine their venture’s hypothesized business model based on instructor, peer, and customer feedback. Participants enter the session with preliminary venture ideas that they would like to work on during the program and then work in teams on a selected venture. • What are the issues, tensions, and relationships faced by entrepreneurs as they build a new venture? • What are common enablers and barriers to venture creation? 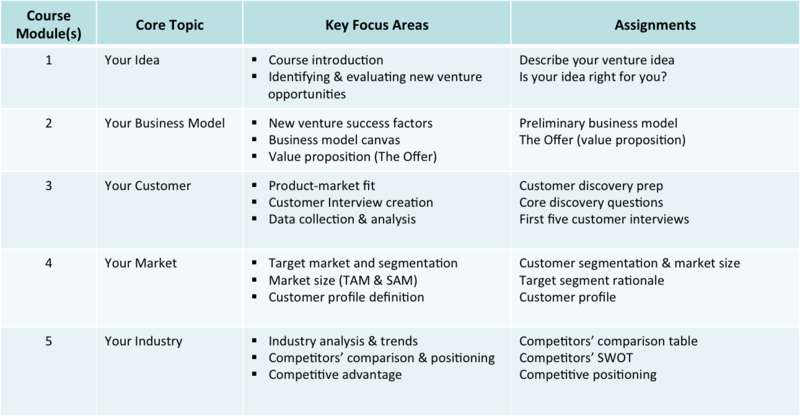 • How to develop a business model to test your assumptions about product offerings and market demand? • How do you assess the current market and position your product offerings for competitive advantage? • What is the most agile way to develop new product and services that will gain market traction quickly? • What are current approaches for cost effective customer acquisition and retention? • How to build credible financials based on reasonable, benchmarked assumptions? • What metrics are critical to measure and monitor new venture success? • How to build the right team and culture for successful launch and early stage growth?